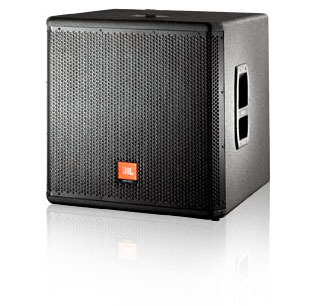 JBL MRX518SCompact 18" Portable Subwoofer System DJParts - All Variety of Parts that DJ Needs. The input panel incorporates a pair of Neutrik® Speakon® NL-4 connectors wired in parallel. The MRX518S is supplied with pins +1/-1 connected to the woofer. This may be easily reconfigured to work with cabling systems intended to drive subwoofers on pins +2/-2. For "Subwoofer/Satellite" configurations, the MRX518S is equipped with a top-mounted, 36 mm pole mount socket that can receive the optional SS3-BK pole. This can be used to mount speakers equipped with standard 35 mm pole sockets and weighing up to 50 kg (100 lbs). The enclosure is constructed of top quality plywood, coated in JBL's rugged DuraFlexT finish and is braced to maximize low-frequency performance. The attractive CNC-machined, 16-gauge steel grille is internally lined with an acoustically transparent screen to provide additional driver protection and give a very professional appearance.